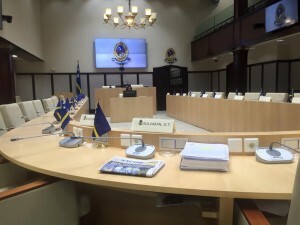 WILLEMSTAD - The faction of the opposition party MFK wants a meeting to debate the position of the current President of Parliament William Millerson. They made this known in a letter to Parliament. The party wants to debate about how Millerson communicates with the MPs. According to MFK, Millerson is unprofessional. To reinforce their case, they have added a letter they received from Millerson. The MFK and Millerson have been in a quarrel for a long time. Earlier, Gerrit Schotte's party accused the President of Parliament of treating the MPs unequally because he did not give them chance to finish their dissertations during parliamentary meetings. If the currently requested meeting is accepted, Millerson will have to preside.